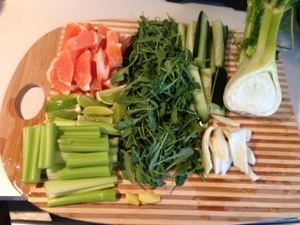 I’ve been asked some great questions by people mostly related to juicing and juicers. I think these may all be things people have been curious about but may be have been too shy to ask or it has possibly stopped them from even juicing. Q: What citrus fruits can be juiced with the rind on? The pith? Q: Should I be removing the skin of ginger, turmeric and other roots for juicing? What does it do for the flavor? A: This question has been lingering around for such a long time now. One person will have evidence that the skin has lots of bacteria. Another will say there is absolutely nothing wrong with it! I personally have been worried about the bacteria and also the earthy looking bits the skins of these leave in my juices. 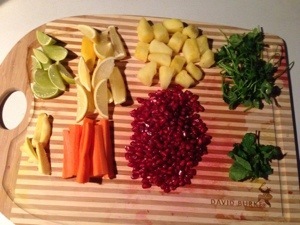 Both eaten raw and as a raw juice I find root vegetables have a smoother and sweeter taste with the rind removed. Q: What herbs and greens do you juice to stay warm? A: I absolutely love this question because people usually have a rough idea, but there are so many more options out there then we realize at times. When I ask people what they would use they usually say; lemon, ginger, cayenne, cardamom, cinnamon, nutmeg, anise, and hot peppers. Other wonderful options are pretty much any herb; cilantro, parsley, thyme, rosemary, basil, oregano and so on. One of my favorite warming greens is Arugula! But mustard greens and cabbage also work wonders. 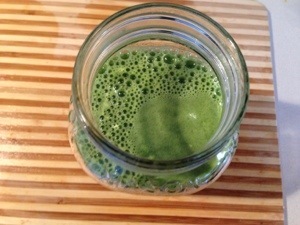 Q: Why do you use an Omega Juicer? What Juicer to do recommend to “newbies”? A: I use an Omega Juicer because the pulp comes out super dry like a dread, there is no heat created, the produce is literally been squeezed and crushed instead of being pressed against a blade. I find the juiced to be easy to wash, travel with, and it even has attachments to make ice cream, dough and noodles. There is usually a 10-15 year warranty on the Juicer depending what model you purchase. Typically I recommend beginners to buy a Juicer that they can afford, $100 or less is my guess. My first Juicer was a Jack LaLanne, I wanted to make sure that I would actually make juicing a habit before spending more money and making it an investment. Q: What tips do you recommend to get someone to make sure they juice? A: Keep your Juicer or blender on the counter, already attached with a cutting board near by. If you have a tight schedule consider washing your produce and cutting it the night before juicing or juice before bed for the next day. 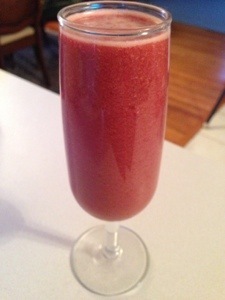 Look up juicing recipes online to get inspired, motivated and thirsty! There are numerous moving stories about people becoming healthier by juicing, check them out 😀 Buy your favorite produce item and at least one fruit, vegetable or herb that you are on the fence about. 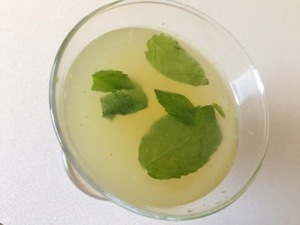 Here are three warming drinks I have made in the past few days. These are all completely different, this first drink reminds me of a cocktail or a wonderful coffee or mate tea replacement.